» Were Japanese soccer fans ‘wrong’ to clean up after themselves at the World Cup? In her article for the business and economics-focused news site, London-based writer Mayumi Tanimoto addresses the issue of Japan’s new-found fame as a country of well-mannered, litter-picking soccer fans. In it, she discusses how it is considered proper in Japan to clean up after oneself in public, giving the examples of outdoor rock festivals, sporting events and cherry blossom-viewing parties to illustrate the way in which the Japanese people behave in public, always gathering up their refuse and taking it home with them if there’s no place to dispose of it. Equally, though, Tanimoto suggests that Japanese ought to be more aware of cultural standards and behaviours when abroad, suggesting that although the football fans who took it upon themselves to gather up their litter may consider it only natural to do so, they may in fact be causing trouble for others, and even doing people out of a job. To further illustrate her point, Tanimoto talks about how, in countries such as Italy, Spain, Belgium and the UK, diners at self-service restaurants and the like frequently leave their trays, empty drinks cups and wrappers on their tables when they leave, knowing that staff are paid to clean up after customers and will see to it when they can. This, she writes, is the “atarimae” way of thinking in many countries. In Japan, however, that’s simply not how things are done. There are no signs to say so, but people – yes, even the cool kids – gather their rubbish when they’ve finished, take it over to the dedicated tray spot and throw it away properly, even going so far as to separate paper and plastics and pour any unfinished drinks and ice into a special receptacle. 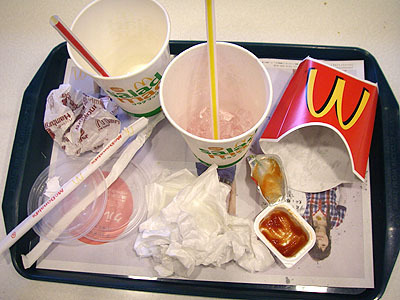 If a member of staff is nearby, they’ll very often take the tray from the diner and dispose of their waste for them, but more often than not, people leave their tables as they found them, and you’re unlikely to find someone else’s rubbish, cups or plates just sitting there when you enter. Tanimoto later writes that, as she learned when a coworker scolded her for trying to help ease their workload by doing a few jobs for them, in countries like Italy, jobs are not easy to come by; trying to ‘steal’ someone else’s job is unforgivable. Similarly, she writes, Japanese should not look down on those from other countries who do not tidy up after themselves at sporting events; these people are behaving in a manner that is natural to them, and when there are so many people in need of work – often living in low-income areas – we ought to look at the bigger picture. Cultural awareness is of course tremendously important; to visit another country and act as you might at home will often land you in trouble, either causing offence to others or possibly even putting yourself in danger. But when it comes to a matter such as tidying up after oneself, which by its very nature makes a shared environment more pleasant to be in, is it really such a crime? Thankfully, it seems that there are plenty of Japanese out there who, while they appreciate the underlying message Ms. Tanimoto makes, weren’t about to abandon their way of doing things any time soon. After the article was picked up by hugely popular bulletin board site Hamster Sokuhou, netizens took to their keyboards to weigh in on the matter. What do you think, Rocketeers? Should Japanese soccer fans adopt the ‘when in Rome’ approach and consider the Brazilian cleaning staff more, or should they stick to their guns, continue to set an example to the rest of us, and keep on leaving their stadium seats as spotless as they found them? After all, isn’t worrying about a lack of mess to clean up about on par with being concerned that security guards don’t have enough fights to break up or bottle-slinging hooligans to tackle? Let us know what you think in the comments section below!